Nail-patella syndrome, is a genetic disease of the connective tissue that produces defects in the fingernails, knee caps, and kidneys. Nail-patella syndrome is also known as Fong Disease, Hereditary Onycho-Osteodysplasia (H.O.O.D. ), Iliac Horn Disease, and Turner-Kieser syndrome. Patients who have nail-patella syndrome may show a variety of physical defects. The hallmark features of this syndrome are poorly developed fingernails, toenails, and patellae (kneecaps). Other common abnormalities include elbow deformities, abnormally shaped pelvis bone (hip bone), and kidney (renal) disease. Less common medical findings include defects of the upper lip, the roof of the mouth, and unusual skeletal abnormalities. Skeletal abnormalities may include poorly developed scapulae (shoulder blades), sideways bent fingers (clinodactyly), clubfoot, scoliosis, and unusual neck bones. There are also other effects, such as thickening of the basement membrane in the skin and of the tiny clusters of capillaries (glomeruli) in the kidney. Scientists have recognized an association between nail-patella syndrome and colon cancer. Nail-patella syndrome is associated with open-angle glaucoma, which, if untreated, may lead to blindness. Patients may also have cataracts, drooping eyelids (ptosis), or corneal problems such as glaucoma. People with nail-patella syndrome may display only a few or many of the recognized signs of this disease. Symptoms vary widely from person to person. Signs even vary within a single family with multiple affected members. The incidence of nail-patella syndrome is approximately one in 50,000 births. This disorder affects males and females equally. It is found throughout the world and occurs in all ethnic groups. The strongest risk factor for nail-patella syndrome is a family history of the disease. Nail-patella syndrome has been recognized as an inherited disorder for over 100 years. It is caused by mutations in a gene known as LIM Homeobox Transcription Factor 1-Beta (LMX1B), located on the long arm of chromosome 9. The LMX1B gene codes for a protein that is important in organizing embryonic limb development. Mutations in this gene have been detected in many unrelated people with nail-patella syndrome. Scientists have also been able to interrupt this gene in mice to produce defects similar to those seen in human nail-patella syndrome. Nail-patella syndrome is inherited in an autosomal dominant manner. This means that possession of only one copy of the defective gene is enough to cause disease. When a parent has nail-patella syndrome each of their children has a 50% chance to inherit the disease-causing mutation. A new mutation causing nail-patella syndrome can also occur, causing disease in a person with no family history. This is called a sporadic occurrence and accounts for approximately 20% of cases of nail-patella syndrome. The children of a person with sporadic nail-patella syndrome are also at a 50% risk of developing signs of the disorder. Medical signs of nail-patella syndrome vary widely between patients. Some patients with this disorder do not display symptoms. These patients are discovered to have the nail-patella syndrome only when genetic studies trace their family history. Scientists are now working to learn what causes different people to display such different symptoms of nail-patella syndrome. The most obvious sign associated with nail-patella syndrome is absent, poorly developed, or unusual fingernails. Fingernail abnormalities are found in over 80% of patients with this disorder. Abnormalities may be found in one or more fingernails. Only rarely are all fingernails affected. This disease most commonly affects the fingernails of the thumbs and index fingers. The pinky fingernail is least likely to be affected. Fingernails may be small and concave with pitting, ridges, splits, and/or discoloration. Toenails are less often affected. 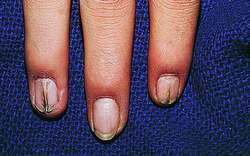 The lunulae, or light-colored crescent moons, at the base of the fingernail bed next to the cuticle are sometimes triangularly-shaped in people with nail-patella syndrome. Kneecap abnormalities are the second most common sign associated with this disorder. Either or both kneecaps may be missing or poorly formed. If present, kneecaps are likely to be dislocated. The knees of people with nail-patella syndrome may have a square appearance. Besides the kneecap, other support structures including bones, ligaments, and tendons may also be malformed. These support structures stabilize the knee, therefore patients with some leg malformations may have difficulty in walking. The hip bones of approximately 80% of patients with nail-patella syndrome have unusual bony projections called posterior iliac horns. These bony projections, or spurs, are internal and not obvious unless they are detected on x ray. This unusual pelvic anatomy is not associated with any other disease. Kidney disease is present in at least 30% of people with nail-patella syndrome. Biopsy shows lesions that resemble those of inflammation of the clusters of capillaries in the kidneys (glomerulonephritis), but without any infection present. Kidney failure is the most dangerous consequence of nail-patella syndrome. It occurs in about 30% of patients who have kidney involvement. An early sign of kidney involvement is the presence of protein or blood in the urine (chronic, benign proteinuria and hematuria.) Kidney involvement is progressive, so early diagnosis and treatment of renal disease is important. Kidney disease has been reported in children with nail-patella syndrome, but renal involvement more commonly develops during adulthood. Various skeletal symptoms may occur. Patients with nail-patella syndrome may not be able to fully straighten their arms at the elbow. This may create a webbed appearance at the elbow joint. Patients may have sideways bent fingers, poorly developed shoulder blades, clubfoot, hip dislocation, unusual neck bones, or scoliosis. Eye problems may be present and vary from person to person. Nail-patella syndrome is associated with open angle glaucoma. Open angle glaucoma is caused by fluid blocked into the front chamber of the eye. This blocked fluid builds increasing pressure into the eye. If untreated, this increased pressure may lead to permanent damage of the optic nerve and irreversible blindness. Some patients with nail-patella syndrome have ptosis, or drooping eyelids. Nail-patella syndrome has also been associated with abnormalities of the cornea, cataracts, and astigmatism. Additionally, the irises of the eye may be multicolored, possibly displaying a clover-shaped pattern of color. As of early 2001, genetic testing for nail-patella syndrome is available only through research institutions that are working to further characterize this disorder. Genetic testing cannot predict which signs of the disease will develop. Nor can genetic testing predict the severity of disease symptoms. Improved genetic testing for nail-patella syndrome is anticipated in the future. Diagnosis of this disease is most often made on visual medical clues such as the characteristic abnormalities of the fingernails and kneecaps. Diagnosis is confirmed by x-ray images of the affected bones and, when indicated, kidney biopsy. The bony pelvic spurs found in 80% of patients with nail-patella syndrome are not associated with any other disease. Prenatal diagnosis for nail-patella syndrome by third-trimester ultrasound was documented in 1998. Prenatal diagnosis via genetic testing of cells obtained by chorionic villus sampling was reported the same year. As of 2001, prenatal genetic testing for nail-patella syndrome is not yet widely available. There is controversy surrounding the use of prenatal testing for such a variable disorder. Prenatal testing cannot predict the extent of an individual's disease. Treatment is usually not necessary. Treatment, when required, depends on each patient's specific symptoms. Severe kidney disease is treated with dialysis or a kidney transplant. Patients receiving kidney transplants do not develop nail-patella type renal complications in their new kidney. A wheelchair may be required if walking becomes painful due to bone, tendon, ligament, or muscle defects. Orthopedic surgery may be necessary for congenital clubfoot deformity. Manipulation or surgery may be required to correct hip dislocation. Cataracts are also surgically treated. Medical treatment at early signs of glaucoma prevents progression of the disease to blindness. Genetic counseling is offered to persons who have the disease. Parents with this disease have a 50% chance of passing it to each of their children. As of 2001, current genetic testing technology cannot predict the severity or scope of an individual's symptoms. Because many possible manifestations of nail-patella syndrome exist, patients are advised to pursue extra medical care including regular urinalysis and special eye exams. Children with nail-patella syndrome should be screened for scoliosis. Survival among patients with nail-patella syndrome is not decreased unless a they exhibit renal complications. It is estimated that 8% of individuals with nail-patella syndrome who come to medical attention eventually die of kidney disease. Berkow, R., M. H. Beers, A. J. Fletcher, and R. M. Bogin. The Merck Manual of Medical Information—Home Edition. McGraw-Hill, 2004. OMIM—Online Mendelian Inheritance in Man. http://www3.ncbi.nlm.nih.gov/Omim. Glomeruli — Tiny clusters of capillaries in the kidney. Hematuria — The presence of blood in the urine. Proteinuria — Excess protein in the urine. a skeletal disorder characterized by absence or hypoplasia of the patella, iliac horns, dysplasia of the fingernails and toenails, and thickening of the glomerular lamina densa; the lower ends of the femur have a shape very similar to Erlenmeyer flask deformity; autosomal dominant inheritance, caused by mutation in the gene encoding LIM-homeodomain protein (LMX1B) on chromosome 9q. a hereditary syndrome consisting of dystrophy of the nails, absence or hypoplasia of the patella, hypoplasia of the lateral side of the elbow joint, and bilateral iliac horns. Also called hereditary osteoonychodysplasia, onycho-osteodysplasia, osteoonychodysplasia. Skeletal disorder characterized by absence or hypoplasia of the patella, iliac horns, dysplasia of the fingernails and toenails, and thickening of the glomerular lamina densa. Edward Everett, U.S. radiologist, 1912–. 194 A>C (Q65P) mutation in the LMX1B gene in patients with nail-patella syndrome associated with glaucoma. Nail-patella syndrome with iliac horns and hereditary nephropathy.